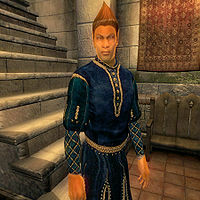 Seridur is an Altmer nightblade who lives in the Imperial City Temple District. He has a bodyguard, Cylben Dolovas, although he doesn't seem to ask his bodyguard to do much in the way of protecting him. Seridur is the head of The Order of the Virtuous Blood, which has its sanctuary in Seridur's basement; during the related quest you will learn more about Seridur and eventually make a tough decision regarding him. Seridur wears a set of upper class clothing: a blue velvet outfit and a pair of blue suede shoes. He carries his key and a large amount of gold. Seridur also knows a leveled set of nightblade spells. At first, Seridur seems by and large a friendly chap, politely greeting you with, "Good day. My name is Seridur. I don't believe we've met." and demurely refusing to discuss the city by saying, "I'm sorry, but my studies keep me indoors for the most part. I know little of the rest of the city." He will also frequently reassure you that "You're welcome here." while in his house, which is accessible even in the early hours of the morning. When you first enter his home after beginning the related quest, he will immediately introduce himself with a little more openness as he refers to sending Ralsa Norvalo after you: "It's an honor to finally meet you. When I heard you were in town, I just had to send for your help. Your reputation precedes you. Oh, allow me to introduce myself. I am Seridur." Returning the courtesy allows him to continue, "Likewise. Sorry to send Gilen's wife to get you in that manner, but it seemed safer if we weren't seen on the streets right now. If you'll come with me." Once you agree he'll warn rather underwhelmingly, "Splendid. Watch your step." A slightly more tense tone will be taken if you attempt to talk to him during the walk, getting, "Shhh. Not here. Keep following." Once in his basement, Seridur will finally get to the crux of things and explain, "Welcome. You're now in the sanctuary of the Order of the Virtuous Blood. Few outside our circle have ever set foot in our hallowed hall. We are, for lack of a better word, defenders. We guard this city from an infestation that plagues it. We are vampire hunters. I'm sure you are familiar with those despicable beings. Feeding on the innocent as if they were cattle. Well, this group was formed to combat them. Alas, we are but 3 old men, not able to match the fighting prowess of the vampire. We lack the strength to defeat them in battle." Asking about vampires will have him continue, "Our goal is to root out the vampires that live in our fair city. So far, we've been unsuccessful finding one until now. It's come to the Order's attention that Temple District resident Roland Jenseric is a vampire, and has already claimed one victim. That's where you come in. We want you to slay this vampire and cleanse the city of his filth before he can feed or kill again." You may then ask about Roland for further context: "A few nights ago, I was roaming the city as I often do, looking for any signs of a vampire. As I headed passed [sic] Roland's house I heard a cry. I rushed into the back garden to find Roland struggling with a woman he'd been courting. I tried to intervene, but he was too strong. He threw his lover to the ground and turned his attention on me. Luckily, I managed to run back into the street and escape his grasp. I hid for a while and then returned to the garden. Roland was gone and the woman was dead. She had two puncture marks on the nape of her neck. That's when I realized he was a vampire. The Order needs you to track him and destroy him." He then advises, "I would start by searching his home. He hasn't been there for days, so it should be safe. Return to us here if you have questions. We meet at night." He is then more than willing to offer up further explanation, offering, "Is there more I can help you with?" If asked, Seridur will add cryptically that "His home is located in the Temple District. Right across the garden from my home in fact. Ironic, isn't it?" He will also offer some advice on dealing with Roland: "Vampires are nasty creatures. They drink the blood of others to conceal their true nature. Such trickery makes them difficult to find. You may ask Gilen Norvalo or Grey-Throat about these creatures as well. They've learned much." He will then bid you farewell with, "Who knows when Roland may strike again. You must hurry." Returning to him after searching Roland's house will intrigue him: "A letter, eh?" He will then continue musing about Roland, adding, "I wasn't aware he had a cabin outside of the city. Perhaps that's where he lures his victims. Be careful, he may have others with him. I'm afraid we cannot go with you to this remote location. Fighting is not our specialty. Watch yourself... vampires are known to be crafty." He will also remind you to check with Gilen and Grey-Throat before leaving again: "I believe that Grey-Throat and Gilen may have more information for you regarding these creatures." If you kill Roland and return to Seridur, he will ask, "I hope you've returned victorious." and "Has the deed been done?" Answering yes will result in a very pleased elf: "Excellent. I knew you wouldn't disappoint the Order. Here's the reward that was promised. However, I must ask that you reveal nothing about us. You've done a great service for the Imperial City, and you should be proud." After that, he will only ever say to you again: "I'm sorry, I'm very busy now. There's still much work to be done. Good day." If you choose not to kill Roland and return to speak with Seridur before finding Phintias, he will ask "Have you slain Roland?" and you will have the option of telling him either that Roland said he wasn't a vampire, or that he wasn't home. The first option will anger Seridur: "Well of course he'd say that! He'd do anything to save his skin! Please, don't let him deceive you. You must return there and put an end to his masquerade. Quickly, before he has a chance to get away!" Talking to him again after this will just get you: "Well, don't just stand there! Go and kill him!" The more delicate touch of a lie will lead him to say, "Hmmm. He must have known we'd look there. Search around town and see if you can find any more information." You may also hear him say, "You look uneasy. I hope things are going well." in passing, after you've discovered his secret and are presumably uncomfortable to be in the presence of a deceitful and dangerous creature. Once you've discovered Seridur's secret, you can ask others involved with the quest how they feel about him. Grey-Throat will say, "Seridur is an honorable man. Forming the Order shows just how much he cares about the Imperial City and protecting its people." Gilen will be similarly admiring, saying, "Seridur? He founded this group a few years ago. I was impressed with his knowledge of vampires. When we decided to make the group official, Seridur offered his basement as our headquarters. Quite nice, isn't it?" Ralsa will be less impressed: "Seridur is a nice enough fellow. For an Altmer, that is. I think he and Gilen, and that Argonian, Grey-Throat, have some kind of a club. They're very serious about it, but I'm sure it's just some boys night out kind of a thing." Phintias will have more to say regarding Seridur and his travels: "Seridur? He comes in from time-to-time. Usually it's when he's out shopping. He always comes in with a large amount of travel food in his bag. Then sometimes he buys a few books. I asked him once about it, and he said that he goes out of the city on business trips. I think I overheard him once mention Memorial Cave to another patron of mine, but he never talked to me about it directly. Yes. It's outside of the Imperial City. I heard it's a place where many of the heroes from past wars are buried. Sort of a subterranean graveyard. I just assumed Seridur had a relative that died and is buried there. Not many people go out there anymore, as the route is dangerous. But Seridur is a stubborn one. Hehe. Takes integrity for a man to risk his own life to honor the fallen. I admire him for that. I looked it up once in an old atlas I had in stock. Here, let me mark it on your map." After learning about Memorial Cave, Gilen will tell you, "Oh, I believe he left a message with Grey-Throat. Something about not being here for a few days?" Grey-Throat will confirm this (as well as Seridur's absence from his home) by saying, "Seridur said we should meet without him for a few days. He said something about doing field research? I'm sure he'll return soon." Upon finding him deep within Memorial Cave and in full armor, he will be "delighted" to see you, exclaiming, "You fool!" You may then speak to him and hear his villain monologue: "Do you really think that I'm surprised to see you here? I let you find me. What better place to get rid of you than all the way out here. No messy bodies left behind, no evidence. I was sloppy last time with Roland's lover, and I won't make the same mistake twice. After I'm through with you, I'll find Roland and finish what I started. I knew hiring you was a mistake, but I had to keep up appearances. The damn "Order" insisted we get you into the picture. I think after I'm done with Roland, Gilen and Grey-Throat will have to be dealt with. Quite a list of things to do, wouldn't you say? Well, enough of my monologue. Time to feed!" He will then engage in battle with you. Roland will be elated by his death when you go to his cabin to tell him: "He's dead? Thank goodness! I feared I'd never be able to leave here, or worse, that he would come for me. I can finally return home. The ironic thing is that I think the Order of the Virtuous Blood should continue its work. Perhaps I'll speak to the others. Yes, I think that the Order will live on. Give me time to make arrangements, and meet me in Seridur's basement." Asking Roland about Seridur again will only get a disgusted "Let us never speak of that abomination again." Gilen will be just as disgusted: "Please forgive my ignorance. Had we known about Seridur, we'd never have put you in harm's way. I'm astounded that the very thing we decided to fight turned out to be in our midst." Grey-Throat will share his companions' feelings: "It's good to see you again. I'm so sorry that we didn't realize Seridur's deception. He was a traitor. Thanks to you, the Order lives on. Long live the Order!" Seridur is indeed a vampire, though rather unique. Instead of the standard vampire abilities, he has a set of abilities similar to a player with second day vampirism. He also gains the typical day two attribute and skill boosts. He does not, however, receive the special vampire spells but neither does he take Sun Damage. This also means that most means of identifying a vampire do not register his status. Another feature of Seridur's unique vampirism is that he is not part of the vampire faction that all other NPC vampires. As factions are used to determine who creatures and NPCs like and dislike, the undead occupants of Memorial Cave will not be able to identify him as an ally, and are very likely to attack him on sight. The vampires and wolves in the cave are less likely to be hostile towards Seridur, because he shares the creature faction with them. He will relocate to Memorial Cave at stage 85 of the quest.